There’s an old saying in fantasy football that goes, “You can’t win your league in the first round, but you can lose it.” That’s a fancy way of saying don’t try to be the smartest guy in the room by reaching for … let’s say a tight end, and in the process bypass the bevy of talented running backs or wide receivers sitting atop the rankings. There’s a more valuable old adage that putting together a championship roster on draft day is all about maximizing value while minimizing risk. That is what we are looking at with this article: Finding the best value pick for each team in the AFC. This doesn’t mean a sleeper, necessarily — it’s just which player offers the best value. If that’s a first-rounder it’s a first-rounder. After an injury-marred 2017 season, Crabtree has landed in Baltimore, giving Joe Flacco a prime red-zone target. Further adding to Crabtree’s value (he’s being selected in the sixth round) is a lack of proven competition for targets in a thin Ravens WR corps. Even with a cloudy quarterback situation it’s always nice to be able to grab a team’s No. 1 WR as the 48th player at his position. Benjamin played hurt last season, putting up just 16 receptions and a single score playing for the Bills. A healthy Benjamin is poised for a bounceback season in 2018. While Joe Mixon gets the preseason love, it’s the veteran Bernard who brings the better value with his current ADP as the 46th running back off the board. Always a threat in the passing game let’s not forget that Bernard can be an every-down back if called on. Last season in Week 16 when Mixon went down early, Bernard totaled 168 yards from scrimmage with a score. The second-year tight end can currently be had in the ninth round and brings solid TE1 upside. The athletic Njoku has been a preseason standout with six receptions for 75 yards and two touchdowns. Let’s forget Sanders’ 2017 season as he battled a high-ankle sprain that caused him to miss four games as well as subpar (I’m being kind) quarterback play for the Broncos. Instead let’s focus on the fact that new starting QB Case Keenum ran a Minnesota offense that supported a pair of top-20 receivers in Stefon Diggs and Adam Thielen. Look for sanders to easily outperform his current ADP as the 36th WR being selected. The veteran Miller gets no love despite finishing in the top-17 each of the past four seasons with a pair of top-10 performances. Still the bell-cow back for the Texans (at least until D’Onta Foreman gets and stays healthy) Miller is the 21st RB being drafted and should easily outperform that position. Currently being selected as a 16th-round option, Grant has already established himself as the Colts No. 2 WR behind T.Y. Hilton. A healthy Andrew Luck will utilize the speedy Grant who is coming off a season in which he set career highs in receptions, receiving yards and touchdowns. Seferian-Jenkins is coming off the best season of his four years in the league, with 50 receptions with three scores in 13 games with the Jets. He’s being selected as a low-end TE2 (20th off the board) and has the real possibility to crack the top-12 in a much more explosive Jacksonville offense. It’s hard to believe Watkins is being drafted as a WR3 as he takes his talents to Kansas City and will have gun-slinger Patrick Mahomes at QB. Often considered a one-trick pony deep threat, Watkins has seen snaps at the slot position this preseason. The attention that Tyreek Hill draws will allow Watkins to shine and the upside of a high-end WR2 finish is in play. After an injury-marred rookie season that saw him play just 234 snaps and finish with just 11-receptions. To date in the preseason, Williams has played 51 snaps, has been targeted six times, and has a 25-yard touchdown. In line to be a red-zone threat with Hunter Henry out for the season, look for Williams to outperform his current ADP as the 49th WR selected. Currently going in the 10th round, Stills is coming off a season in which he was targeted 105 times and finished with low-end WR2 totals in 12-team PPR formats. With Jarvis Landry now in Cleveland, Stills should see more targets and could add to his 15 total touchdowns in the last two seasons. Already a productive PPR option out of the backfield, White will see more usage with the departure of Dion Lewis, the Julian Edelman suspension, and injury concerns with Sony Michel (who has returned to practice) and Rex Burkhead. In the past three seasons, White has 156 regular-season receptions with 12 receiving touchdowns and is currently a 10th-round draft selection. Despite head coach Todd Bowles’ plan to ride the hot hand, I see Crowell emerging as the early-down back. It’s also not a given that Crowell will leave the field on all passing downs in favor of Bilal Powell. In the past two seasons Crowell has caught 68 passes and is a nice ninth-round selection with upside. Is Lynch the back he used to be? Definitely not. Is he the 28th best fantasy option at RB as his current ADP suggests. Definitely not. 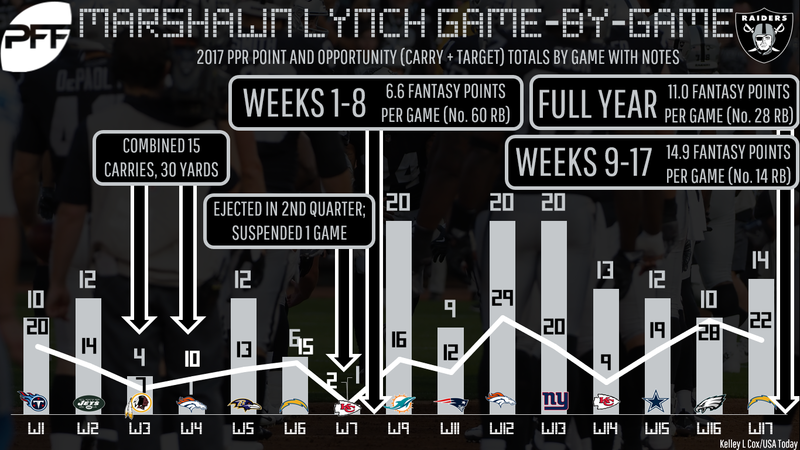 After a slow start last season, Lynch amassed 738 total yards and five touchdowns in the final eight games, which were top-15 totals in PPR scoring. For some reason, Roethlisberger is being drafted as a QB2 (13th off the board at the position) and it’s mystifying. With such weapons as Le’Veon Bell, Antonio Brown, and the emerging JuJu Smith-Schuster, there is no way Roethlisberger finishes outside the top-10. The addition of new offensive coordinator Matt LaFleur and the subtraction of the knee brace he wore for much of the 2017 season will have Mariota bouncing back big time in 2018. Look for more spread offense with more deep passes and for Mariota to flirt with top-10 totals despite currently sitting as an 11th-round draft selection.